1. Access by Proximity: Walkable access from housing to basic urban services and transit access to close-by employment options. 2. Clean Air: Air quality conducive to good health within buildings, the city’s air shed, and the atmosphere. 3. Healthy Soil: Soils meet their ranges of healthy ecosystem functions as appropriate to their types and environments; fertility is maintained or improved. 4. Clean and Safe Water: Access to clean, safe, affordable water; the city’s water sources, waterways and water bodies are healthy and function without negative impact to ecosystems. Water is primarily sourced from within the bioregion. 5. Responsible Resources/ Materials: Renewable and non-renewable resources are sourced, allocated, managed and recycled responsibly and equitably, without adversely affecting human health or the resilience of ecosystems. 6. Clean and Renewable Energy: The city’s energy needs are provided for, and extracted, generated and consumed, without significant negative impact to ecosystems or to short- or long-term human health and do not exacerbate climate change. Energy consumed is primarily generated within the local bioregion. 7. Healthy and Accessible Food: Nutritious food is accessible and affordable to all residents and is grown, manufactured and distributed by processes which maintain the healthy function of ecosystems and do not exacerbate climate change. Food consumed is primarily grown within the local bioregion. 8. Healthy Biodiversity: The city sustains the biodiversity of local, bioregional and global ecosystems including species diversity, ecosystem diversity and genetic diversity; it restores natural habitat and biodiversity by its policy and physical actions. 9. 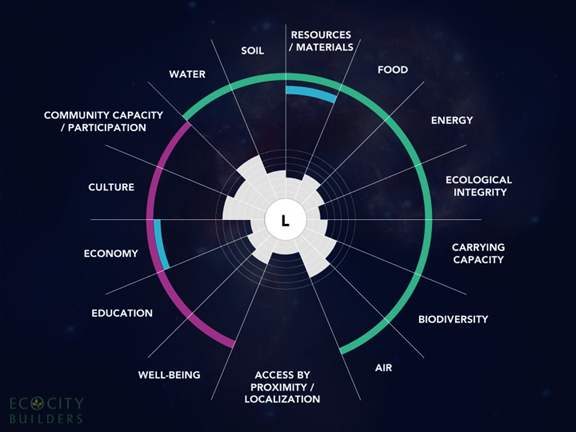 Earth’s Carrying Capacity: The city keeps its demand on ecosystems within the limits of the Earth’s bio-capacity, converting resources restoratively and supporting regional ecological integrity. 10. Ecological Integrity: The city maintains essential linkages within and between ecosystems and provides contiguous habitat areas and ecological corridors throughout the city. 11. Healthy Culture: The city facilitates cultural activities that strengthen eco-literacy, patterns of human knowledge and creative expression, and develop symbolic thought and social learning. 12. Community Capacity Building: The city supports full and equitable community participation in decision making processes and provides legal, physical and organizational support for neighborhoods, community organizations, institutions and agencies. 13. Healthy and Equitable Economy: An economy favoring economic activities that reduce harm and positively benefit the environment and human health and support a high level of local and equitable employment options – the foundation for “green jobs”. 14. Lifelong Education: All residents have access to lifelong education including access to information about the city’s history of place, culture, ecology, and tradition provided through formal and informal education, vocational training and other social institutions. 15. Well Being – Quality of Life: Strong citizen satisfaction with quality of life indicators including employment; the built, natural and landscaped environment; physical and mental health; education; safety; recreation and leisure time; and social belonging. Sebastian von Holstein is the online editor for Permaculture magazine and also the founder of the newly launched Von Holstein Group, which aims to restore health and balance to communities through the arts, design and architecture.